Beautiful and colourful Bernese Mountain Dog art - joyful pet art for lovers of this gorgeous giant breed. A true gentle giant, I love the big, friendly Bernese dog - like a huge fluffy teddy bear. These big dogs are good-natured companions to the family - lovely, gentle, and patient. Meet beautiful Billy (William) - such a lovely, slow, and big-hearted dog - a wonderful friend! You can purchase my Bernese Mountain Dog art print in my online art store (international delivery available). 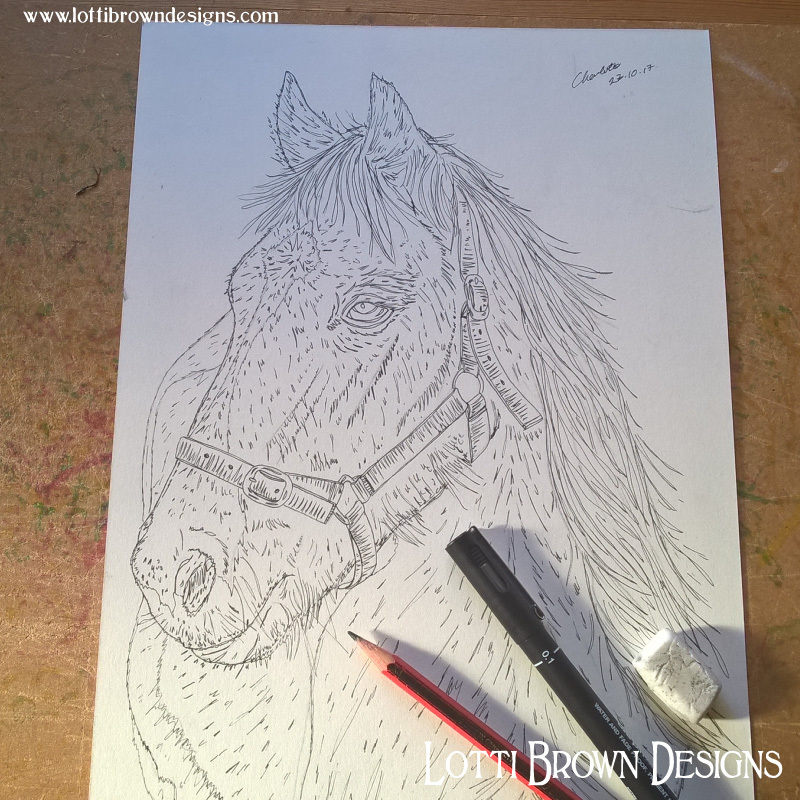 You can see more pet art in my pet art gallery - or perhaps you'd like to find out about commissioning your own custom pet portrait to immortalise your own pet in colourful style..? In this piece, I wanted to celebrate the beauty of this majestic creature - one of humankind's animal friends for thousands of years. Humans have a very close bond with horses and it's simply wonderful to see people and animals working together. I showed this very handsome black and white horse against a purple evening sky, which really sets off his beautiful golden mane. Stunning! 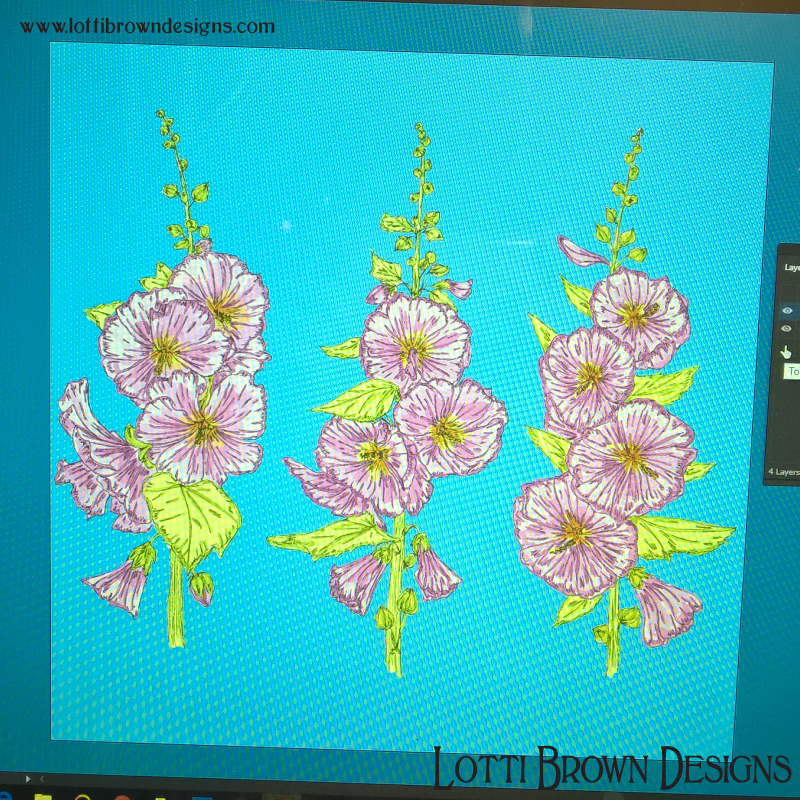 I use my own ink drawings and put them together digitally to create the final artwork piece. 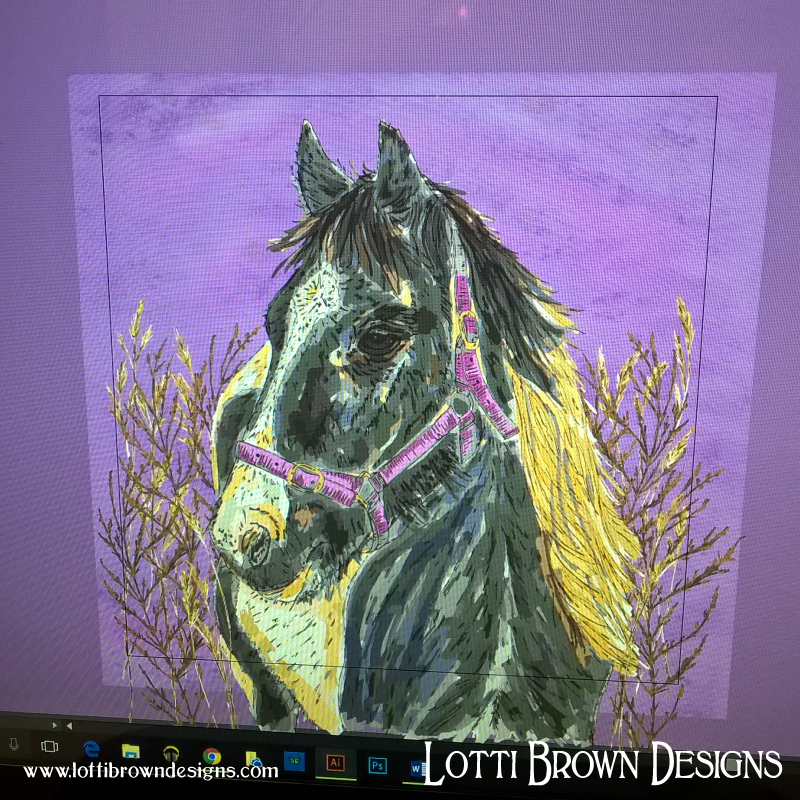 The final horse art print is colourful and contemporary - and very sweet. This horse looks like the sort of horse I would have adored as a child! I could have spent hours brushing that long, flowing mane! Detail from the horse artwork. Note the subtle blend of colours and slight texture effect in the background. I loved creating my gorgeous Great Dane art - remarkable dogs - so large and impressive, yet they're real gentle giants. In our village we used to see the Great Dane, Daisy, running alongside her owner's bicycle - I'll tell you, it was quite a sight! I wanted my artwork to show the beauty and mild-mannered nature of this huge hound. Slightly intimidating through sheer size, but every Great Dane I've ever met has been essentially friendly and gentle. The completed artwork is filled with warmth and friendliness - perfect for this over-sized charmer! And if with a companion call out, "Look! 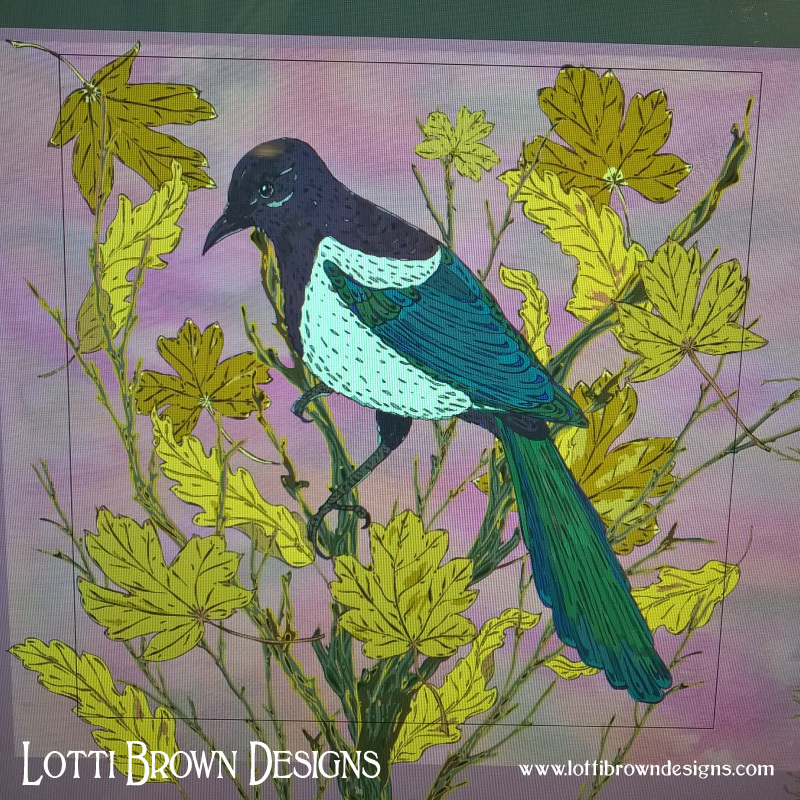 A magpie!" Then mutter quickly, "Seen by two, never comes true..."
Perhaps it's just the magpie's reputation for stealing your shiny belongings, which it hides in its nest...? So it's certain that the magpie does have that special, mystical air that causes so many populations to set him apart from other birds - and the magpie itself is a very intelligent bird - clever, resourceful and a fantastic mimic... no wonder people have always seen the magpie as something very special. And you can barely see a more striking bird in our British landscape and gardens... large and with a very distinctive stripe - there's no missing such a handsome and dramatic-looking bird. No wonder the magpie is recognised across the world as special...! The story behind the artwork is in the title - You Can Get By with a Little Help From Your Friends. It's all about how nature can get by more easily with a bit of a helping hand from us, her friend, especially in planting flowers to help nature in our gardens. 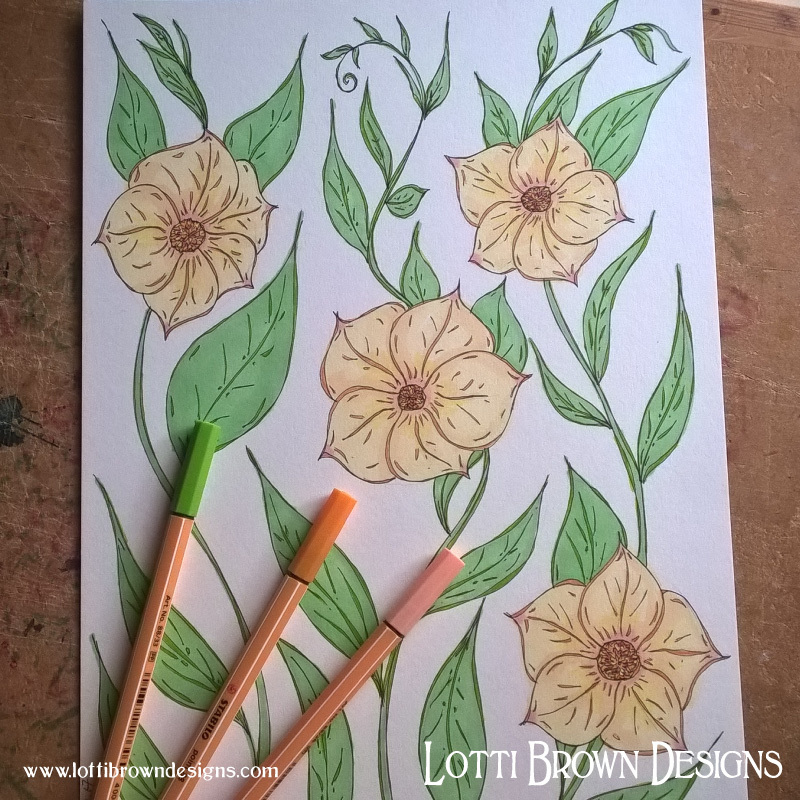 The flowers I chose to include in my Autumn Flowers artwork are all significant, as well as beautiful. They are all flowers which are particularly attractive to bees. And we so need to look after our bees and pollinators to help the natural world go round. Pollinating flowers and plants allows them to fruit and set seed, and return again in the future. It helps provide other animals, birds, insects, and even us humans, with fruit and food to eat. Bees perform a vital role in nature, and are under threat. Anything we can do to help them out is surely a good thing. And when you can have flowers as lovely as this in your garden, well, why wouldn't you? Autumn is a great time to add more flowers into your garden. It helps extend the pollen season for bees and other insects, when there are fewer flowers about, generally. And also helps to brighten your garden up through the fading months. I've often seen bees buzzing around heather flowers. I love that this piece is full of those gorgeous, rich autumn colours, full of warmth for the colder months - and I love that it's so full of different colours, like a rainbow-filled flower garden. It still makes me happy every time I look at it, and I hope it can do the same for you, too! 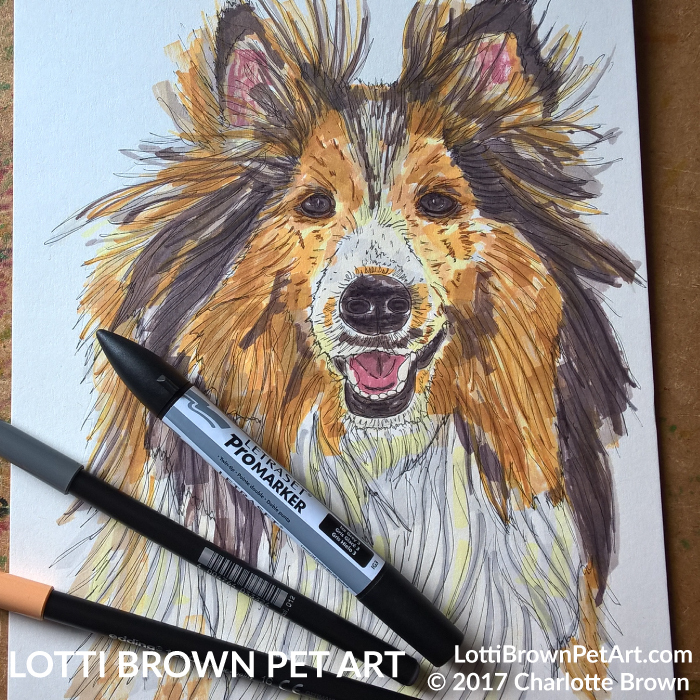 This artwork is of a beautiful Sheltie, Chloe. I’m a little bit biased over looks, of course, due to the unmistakable similarities in appearance between the sweet little Shetland Sheepdog and my own ‘adopted’ breed, rough collie. If you actually saw the two breeds together, though, you would quickly spot the size difference, as the sheltie is just a fraction of the size of a full-grown rough collie. Shelties aren’t just small rough collies. They have their own breed heritage – evolved from Scandinavian herding dogs brought to the Shetlands as working herding dogs in the 18th Century and crossed with smaller breeds, such as spaniels and Pomeranians. There is rough collie heritage in the mix too, though. Shelties have their own breed personality, too – sweet, sensitive, and very loving and companionable with their family. They are clever, playful, and talkative, and they need lots of mental as well as physical exercise. 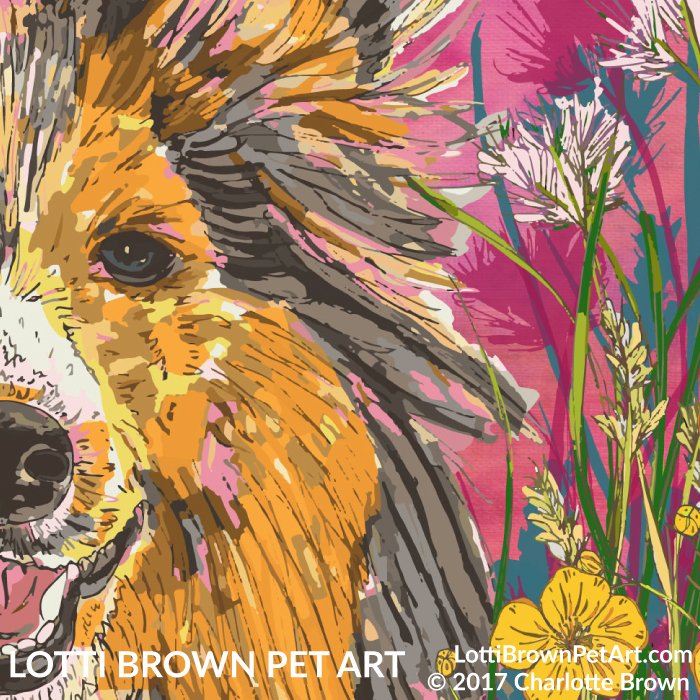 I wanted my sheltie art to show this lively, playful side, so I filled the artwork with bright colours and lots of energy. You can’t fail to be won over by Chloe’s sweet smile and joyful expression. I really love the way my sheltie’s face just seems to explode from the artwork, her eyes fixed on you and her gorgeous fur flying all over the place, filled with light and movement. I am always transfixed by the way that sheltie (or rough collie) fur catches the sunlight and seems to shimmer. 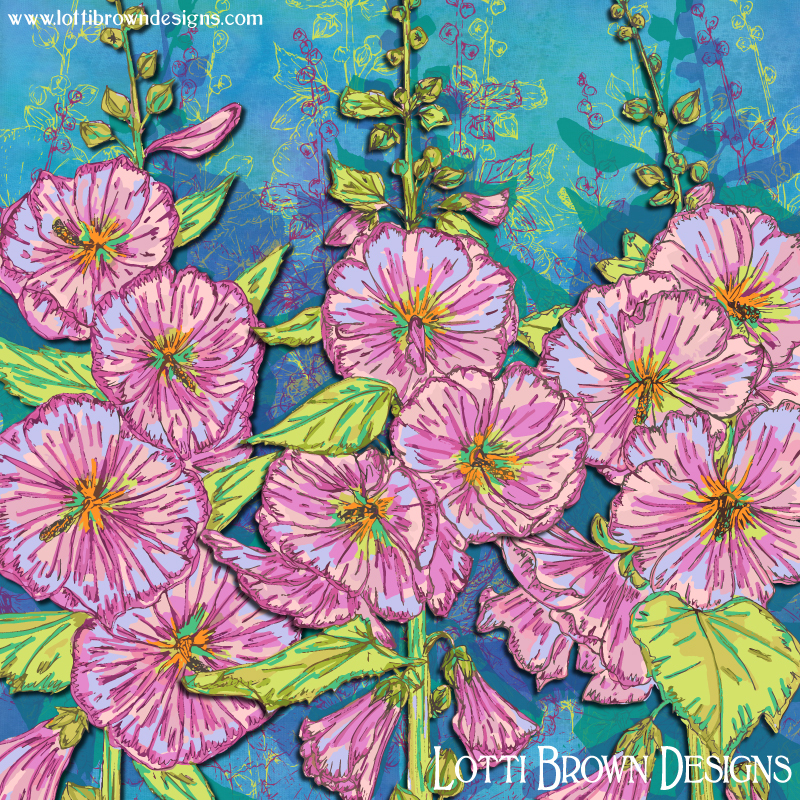 I love the way the air seems to ‘buzz’ around the flowers and grasses – full of life and the energy of nature. This may well be my new favourite artwork, actually! This is an artwork of a beautiful husky dog. Luna is a real wonder of nature – free-spirited, intelligent and perfectly at home in the great outdoors, running through the forests of northern Europe and the Siberian steppes. Huskies are stunning dogs with the real air of a wild wolf about them – nature just about tamed. In spite of their wolfish appearance, they’re not at all wolfish in temperament and are a true friend to man – sweet, friendly, intelligent, and a wonderful companion and working dog. I wanted to show my husky in a setting of nature - natural fir branches and pine cones from a cool northern forest where I hope my husky will feel right at home. The cool ice blues set against turquoises, teal, and a rich russet give a sense of the incredible energy of this truly remarkable dog. I love her intelligent and curious expression – alert, playful, and ready to go. I hope that my artwork brings you a sense of how this independent dog belongs to nature and the wild forests. We’re privileged to have such amazing dogs as part of our human world. I love how all the colours in my husky artwork speak of forest tones – greens, browns, oranges and greys – a celebration of nature. Cute corgi art for your home. Makes a fantastic gift idea for corgi lovers. This is an artwork of a sweet little corgi, Morgan. She’s a Pembroke Welsh Corgi with beautiful golden fur and such a pretty little face. Morgan is very much a family dog, enjoying companionship and play with her owners, but feeling more shy and reserved with strangers. Originally bred as herding dogs, corgis are independent, intelligent, loyal and eager to please. Little dogs in size, but can be feisty, thoughtful, or even clownish in nature. The corgi story that really captured my imagination is the legend that corgis were originally the steeds of Welsh fairy warriors and were ridden into battle by the fairies or pulled fairy carriages. Supposedly, two Pembroke Welsh Corgis were given to two human children by the Welsh woodland fairies. 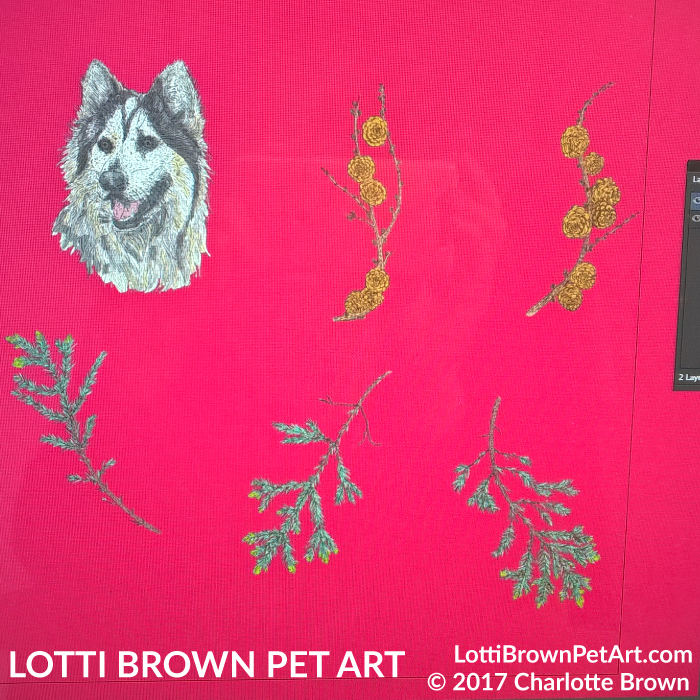 I create my artwork by drawing the dog portrait and accompanying flowers and other elements separately. I work with pens on card. I then scan the drawings into the computer. I chose to surround my corgi with red poppies. Poppies have been associated with fairies and are said to bring fairies into one’s dreams. I’ve also included ferns from the fairies’ magical woodland home. In the Language of Flowers, ferns are also connected with magic. I wanted to include fairy mayflies dancing across the artwork. These beautiful, tiny insects really do look just like fairies as they flit above woodland streams and as the sunlight catches their delicate wings. Morgan certainly looks entranced! 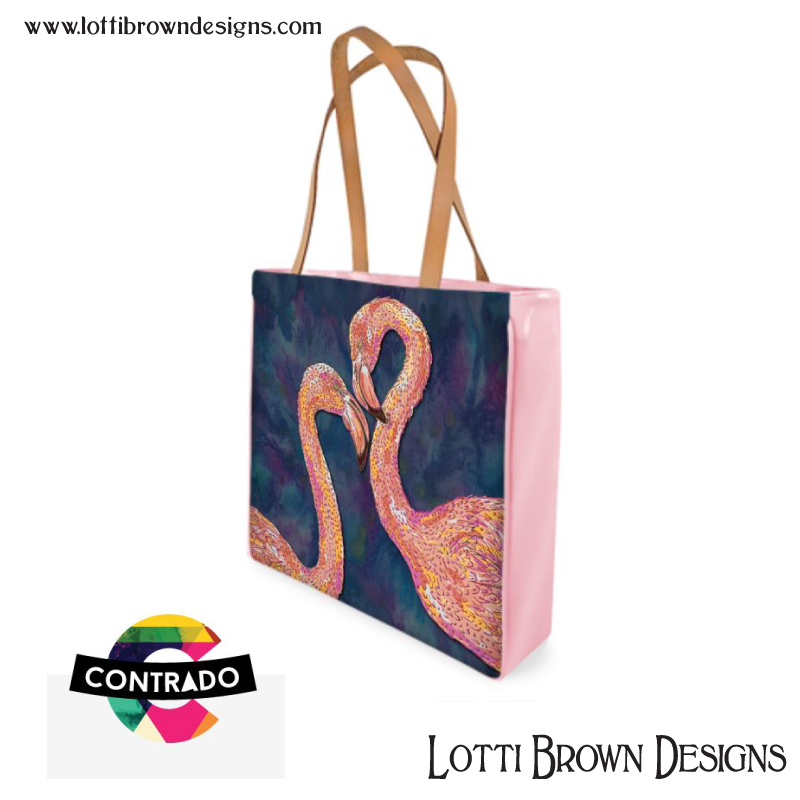 I love the really vibrant colours in the artwork – the lively mix of teal, green, red, gold, pink, and orange. I love the bright, whimsical expression of this gorgeous little dog and how the magic seems to dance all around her and enchant her. Steed of the woodland fairies… will you ever see your corgi in the same light again? Say hello to gentle Jeannie, a beautiful tabby cat luxuriating in the glorious sunshine of a cottage garden. I love tabby cats. The pattern of their coats is so incredibly pretty, with the soft tiger stripes, broken up with dapples of colour. It is thought the word ‘tabby’ relates to the Old French word tabis (meaning a silk cloth), referring to the beautiful striped pattern of their coats, like watered silk, giving them a soft, luxurious fur with a distinctive pattern. It’s a kind of camouflage effect, inherited from their wildcat ancestors, so that they can lurk amongst the undergrowth and stalk their tiny prey undetected. I think it’s pretty effective for them, don’t you? Cats seem to live for the warmth of sunshine. That’s why I wanted to wrap my beautiful tabby cat in sunshine and summer flowers. Jeannie cat is surrounded by pencilled cranesbill flowers (Geranium versicolor) which mean ingenuity in the language of flowers. I think that ingenuity is one of the truly wonderful things about cats. They’re curious, clever, observant and thoughtful – and if they want something, they can be tremendously single-minded about getting it. That’s where the ingenuity bit comes in! I chose to fill my garden with vibrant summer colours - hot yellows, oranges and pinks, filled with the heat of the summer sun. Feel those balmy summer days – warmth on your skin, just the chirping of birds, a low, rumbling purr, the soft murmur of insects buzzing, and that sensation of utter relaxation as you unwind in your garden, a cuppa or a cocktail in your hand and the sun on your face. What bliss! I created my tabby cat art from a series of separate drawings that I scanned into Adobe Illustrator and put together into one single artwork. The completed tabby cat artwork - sunshine and happiness! It’s a pretty nice sort of day to spend some quality time with the kitty – a soft bed of sweetly-scented flowers, the smell of sunshine in her fur, and a whole cast of little birds to watch sleepily out the corner of her eye. Too lazy to move far, today, though. Just enjoy the warmth of the day, together. I love my pretty tabby cat art – following the patterns in kitty’s soft coat, getting lost in the depths of that gentle look in her sea-green eyes. Relax and unwind. Oh, yes! Highland Cow Art - Moo! I created this artwork for my husband, who loves highland cows. We love to see them when we holiday in Scotland, and even spot them in our home county of Yorkshire from time to time. They're always a thrill to see, and seem to be from another time - a bit like a woolly mammoth version of a cow, all long hair and horns... beautiful creatures, who seem very gentle and sweet-natured. As soon as I saw this beautiful photo, I immediately wanted to draw the cow - those beautiful curvy horns and all that lovely long hair! And the beautiful sky effect which makes me think of the Northern Lights - a reasonably regular sight in the far north of Scotland, but one I've not (yet!) been lucky enough to see. This is a beautiful, peaceful artwork - a highland cow taking the time to stop and stare - so much beauty in nature! My husband loved his surprise gift, by the way! Do you know someone who would love to receive this, too? I created this greyhound artwork for a friend of mine, Sally, of her two dogs, Rosie (a fawn greyhound) and Abi (the black one). This is a special artwork for me, as Sally’s dogs are very much part of her identity. And they are very much a part of our friendship, too, as we got to know one another through our shared love for and experiences of greyhound ownership, talking about our dogs. I feel like I know Rosie and Abi well, and I know how special her greyhounds are to Sally, too. Typical greyhounds, Rosie and Abi are gentle souls, dignified and beautiful. Abi was quiet, with a silly streak and a skip in her step, while Rosie has always been top dog in the houndie-household. Together, Rosie and Abi made a tight-knit duo, as close as sisters – light and dark, yin and yang. They definitely needed to appear as a partnership in this artwork. I also know that Sally loves to take photos of flowers (as well as dogs) and has lots of pretty flowers in her garden, so I surrounded her dogs with beautiful blooms. I chose a beautiful yellow dahlia, ‘Sunlady’, bright like sunshine, that is a particularly special flower for Sally, reminding her of Abi, sunbathing in the sunshine outside, at every opportunity. The dahlia also means ‘dignity’ in the Language of Flowers, and I can think of no other greyhound who that suits better than pretty and dainty Abi. A pink rose means ‘friendship’ which I thought was perfect to symbolise both the close friendship between the two greyhounds, and also for my friendship with Sally. I chose particular colours for the background of the artwork, too - a rich red, blending up to a velvety violet. Sally has always chosen collars and harnesses in red for Rosie and purple for Abi, so these colours are especially associated with the dogs and suit their colourings so well. I love the really vibrant colours in this artwork – full of the energy, happiness, and friendships that dogs bring into our lives. I think it’s a really bright and striking colour palette, that I hope will make Sally smile every time she sees it. Makes a wonderful gift idea for a German Shepherd dog owner. This is an artwork of a beautiful German Shepherd dog, Lyla – keen, alert, and devoted to her owner. I loved creating this piece. It was a privilege to take a look behind the preconceptions of the German Shepherd dog as a fierce, guarding dog to celebrate her intelligence, obedience, and loyalty to her owner. Although, obviously, there is very valuable use of German Shepherd dogs in guarding duties, there’s so much more to the breed. Her intelligence, courage, and confidence are just some of the qualities that make her a natural guarder. But that’s not to overlook her alert demeanour, making her eager to learn and to work, nor her fearless devotion to her owner. Lyla, here, is such a truly beautiful dog, with her thick, wavy fur, alive with colours, and her keen, lively eyes. In this artwork, I want to emphasise her loving loyalty, as a companion and friend to her owner; her keen intelligence, which makes her such a pleasure to be around; and her immense courage and confidence. I chose to surround Lyla with these splendid, purple-blue Monkshood flowers (Aconitum). These flowers have a very special meaning in the Language of Flowers, signifying chivalry and the bravery and devotion of the medieval knight-errant. I think this is a really lovely meaning for a German Shepherd dog, pointing in particular to her courage and protective nature, as well as her devotion to her own family. 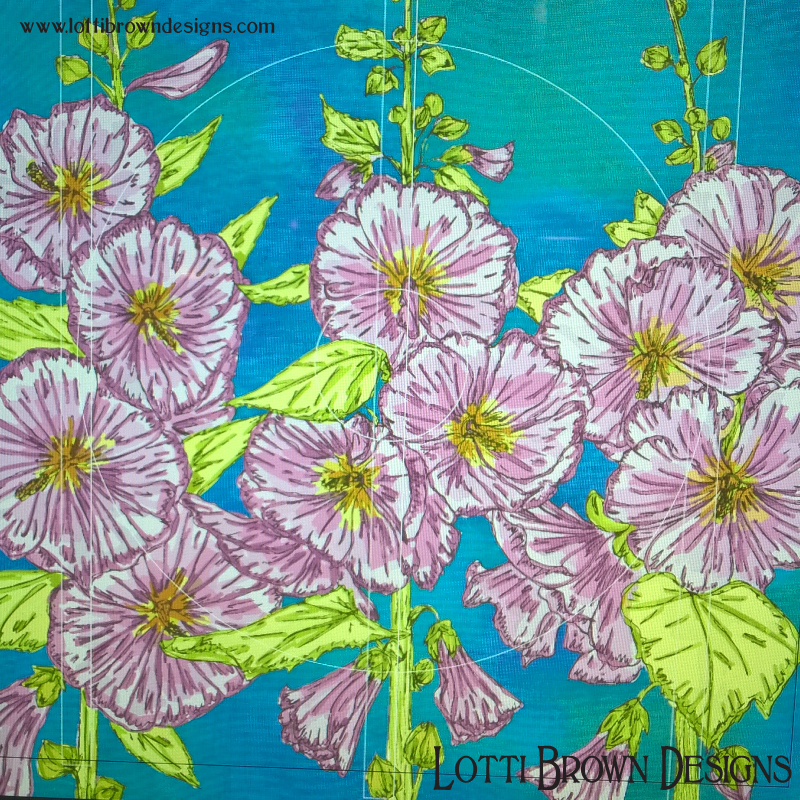 I created my artwork from pen and ink drawings, dog and flowers all drawn out separately. I scan the drawings into the computer and import them into my illustration programme. I play about with composition and colour to create the final piece, adding layers of interest to create a sense of depth. I just love the fiery orange background I’ve chosen for Lyla’s artwork. The colour signifies her energy and her passion for her work, the tasks she’s so keen to learn to do. It’s a very particular orange that I took some time to choose, with a slight coral-pink tone to it, showing a little of her soft, family side, devoted and loving with her special people. I love this piece as I think Lyla shows such alert intelligence in those sparkling eyes, but also a certain softness, and loving nature too, a special connection with those she trusts and calls family. Lots of lovely detail, vibrant colours and a hugely powerful energy. I named this artwork after my granny’s dog, Bracken, as there’s something about her pretty face that reminds me of the original Bracken, even though her colouring isn’t quite the same. But it meant that I just had to draw her. Bracken was well before my time because she was my granny’s collie when she was young, but my granny gave me her photo of her beloved dog when I was a little girl. I loved this photo, pinned it up by my bed, and used to pretend that Bracken was my dog. We couldn’t have a dog or cat when we were children because of my brother’s allergies. So, to an imaginative child, Bracken was a great - if not wholly satisfactory - substitute. So it’s in honour of my granny and her dog, Bracken, that I’ve created this pet portrait. Border collies are wonderful dogs – highly intelligent, eager to please, full of energy, sensitive, and a faithful and firm companion. They need a job to do, and, just like my own (rough) collie at home, are apt to find their own mischief to get into if you’re not giving them some more worthy task to fulfil. Unlike my rough collie, though, they are highly active and energetic, so that enormous physical energy needs to be run off, too. In reward, though, you will have a keen, devoted and clever companion who works and plays with equal enthusiasm. I chose to put beautiful Bracken with Cardinal Flowers (Lobelia cardinalis), red lobelias, which signifies energy in the Language of Flowers. 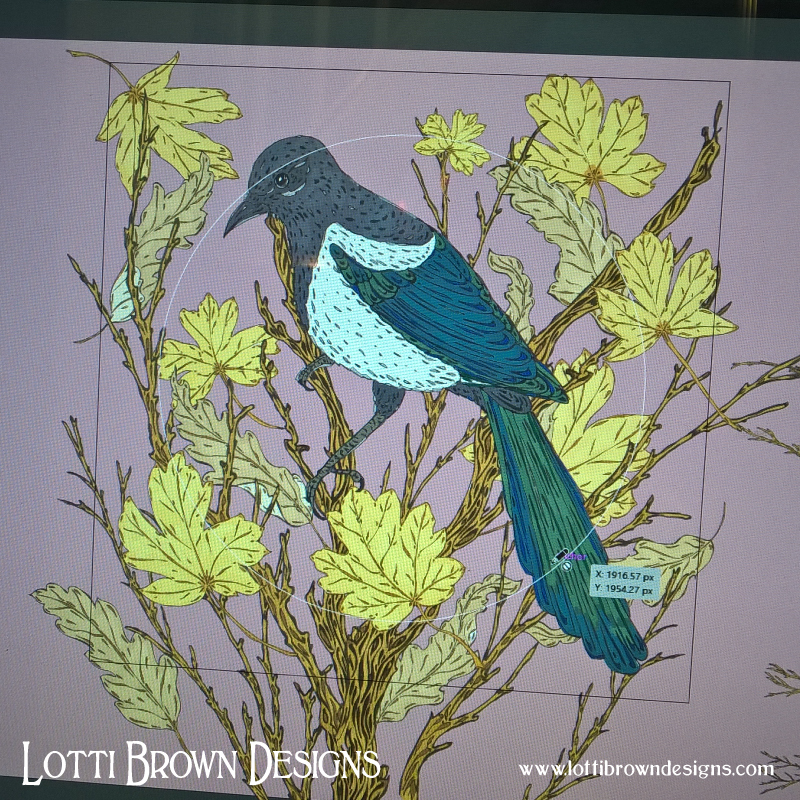 I was also originally intending to include Ragged Robin (Meadow Lychnis) in the artwork – signifying her wit – but in the end, this didn’t make it to the final cut for compositional reasons, as you'll see below. Bracken is such a pretty border collie, with a gentle expression, but it’s an expression that’s full of lively fun, too, and it was this that I wanted to focus on bringing to life in the artwork. I made sure that I used bright colours to show her lively energy, and I couldn’t help but reach for this lovely sunshine yellow that’s a real favourite of mine. Bracken looks like she’s in a field of flowers, running, playing, having fun. The whole picture is filled with movement, from the swirls of her beautiful fur to the swaying flowers. And that really tells you what Bracken’s about – liveliness, fun, energy, I wanted to capture it all. But if you stop and meet her eyes, you can see into her soul, see her sweet nature, her devotion, and her intelligence. Bracken is a special dog – your faithful friend, a bond of love. I love this artwork because it tastes of freedom - a carefree summer day, enjoying the fields and flowers, just you and your dog. Makes a fun and fantastic gift idea for a special dachshund owner, or just to treat yourself. This is an artwork of a charming little dachshund, Daisy, surrounded by colourful and joyous sunflowers. I’ve always been fascinated by lively little dachshunds – such a very unusual shape for a dog – when you watch them move, they seem to slip and flow, undulating like an otter in water as they wriggle. All dachshund varieties have something special about them, but the black and tan short-haired dachshund just seems to shine and shimmer in the light, with a whole host of beautiful colours reflecting in her fur. 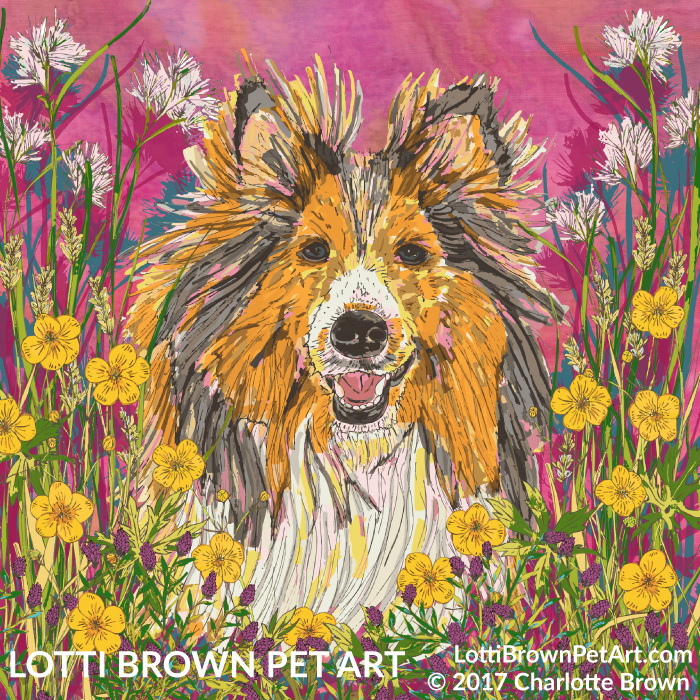 In this artwork, I wanted to show how the personality of this clever, brave, and proud little dog is so much bigger than her tiny size – as tall as a sunflower, flamboyant, and colourful. That’s why I think my beautiful little Daisy Dachsie looks right at home amongst these splendid sunflowers – a proud, charming little dog, bright and so full of energy – an oversized personality compared to her stature. In the language of flowers, sunflowers signify pride, and also adoration. Adoration is one thing that this cheeky little dog won’t go short of. She’ll adore you and long to be your constant companion, and in turn, you’ll adore her fun-loving temperament right back. I love this piece as it’s filled with so much joy, energy and colour. I love the glint in Daisy’s eye. She looks alert, curious, and ready to explore. Sweetness of a young doggy-friend – rough collie art of my pet 'puppy', Noah. Makes a wonderful gift idea for a special rough collie owner - or treat yourself to something really meaningful to celebrate your connection with your own rough collie best friend. This is an artwork of my rough collie, Noah. Noah came to us at 7 months old, in 2014. He fills our home and our world with his sweet and curious personality – and his giant, thick, fluffy coat. It’s like having an enormous, soft and soppy teddy bear living with us. At the age of 2, when I completed this artwork, Noah is part-way between a puppy and a grown-up dog. He is still quite puppy-ish in his head, and sometimes in his play, but growing up quickly. He has these quiet, solemn moments where he sits, observing, taking everything in and having a good old think about it all. Rough collies are really beautiful dogs – truly magnificent – so I wanted to show Noah in a pose that made the most of his impressive, soft, fluffy coat, and the way his soft mane swirls beautifully around his shoulders. And I also wanted to capture the quiet, thoughtful dog that he’s growing into. Truly majestic, but he’s still definitely got a cheeky glint in his eye, though. Although my sensible head knows that at this age, Noah is no longer a puppy, and ‘should’ be considered an adult dog, in my heart, he’s still my puppy, and I have to admit to calling him ‘my puppy’ still, particularly when he’s being sweet and cuddly. I chose to surround my ‘puppy’ with these sweet, little, blue flowers, as they signify, for me, a kind of innocence and sweetness that I feel is in his nature. Like most rough collies, Noah does tend to a sweet-natured, thoughtful, and kindly temperament. The flowers are drawn from a coreopsis flower, meaning ‘always cheerful’, and that’s what I want for my sweet Noah – to be always surrounded by love and happiness with his family – innocence and loveliness filling his world, just like these little blue flowers dance around him in this artwork. 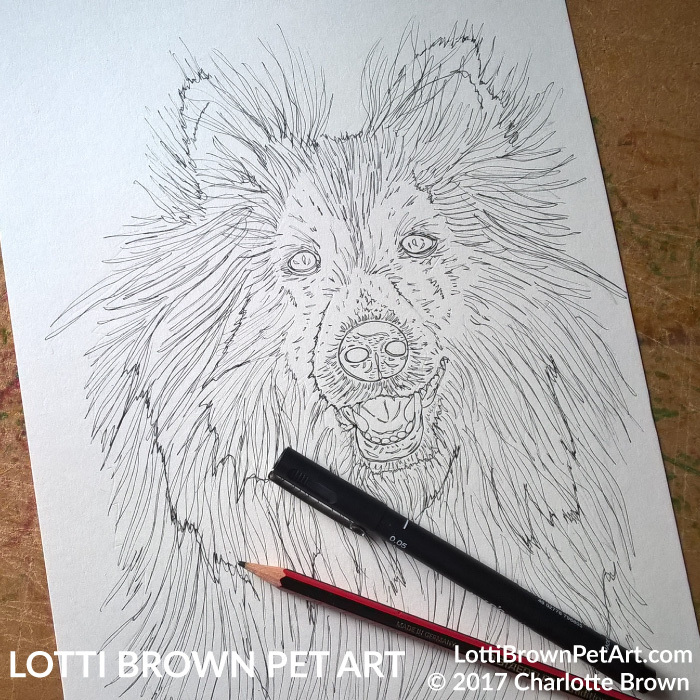 Take a look how my rough collie art developed. Please click on the pictures for a larger image and more detail. When I look at this picture, I feel a protective love for my dog. Meeting his eye, I feel that we share an incredibly strong bond of love and protection, and I want my puppy to feel safe and happy. I love his sweetness, his cheekiness, and his thoughtful, quiet moments, and it's those I see in this artwork. Makes a delightful and really unusual gift for a pug lover! This is an artwork of a pretty little pug, Lizzy. She’s a charming, happy-go-lucky little thing, delighted just to be with you. Pugs are cute little dogs with a curiously sweet face. They have the hugest, most beautiful, innocent eyes, giving them an expressive baby-face that means they can totally get away with all the funny, clownish antics they enjoy so much. I love their funny faces: the unusual swirls of skin, like overgrown wrinkles, making it appear as if they’ve screwed up the soft fur on their cheeky little faces into a tiny tantrum. Perhaps, that’s how they got the name pug, originally meaning goblin or small monkey, apparently. But they’re so loving sweet-natured and charming at the same time, polite, easy-going, and a joy to have around the house. In fact, in the past, pugs were a highly valued companion, favoured by royalty including Chinese emperors of the Shang dynasty and Queen Victoria. Pugs were celebrated with portraits and statues, so it seems very apt for me to be celebrating the sweetness of the pug with this pug art, too. I wanted to celebrate the affectionate, loving nature of this dog, and her sweetness and childlike, innocent expression. 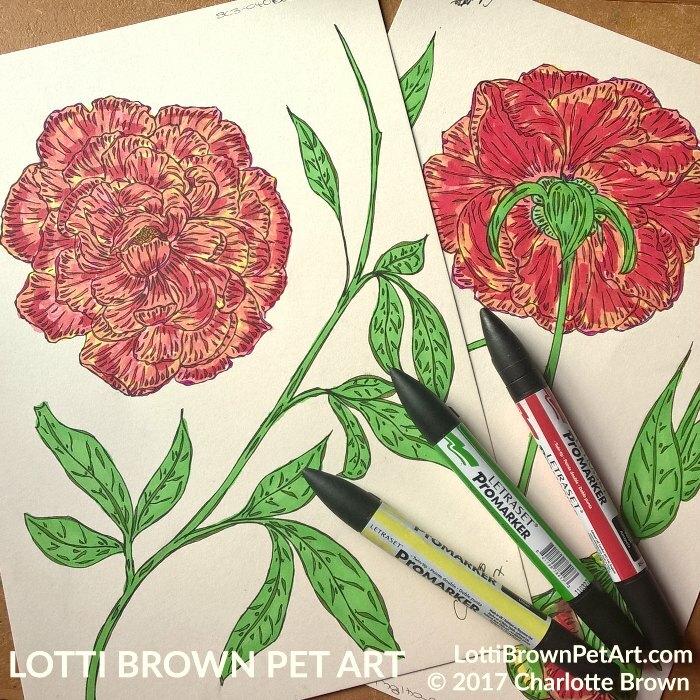 I chose to do this by including beautiful, big, red peonies in her portrait. The Language of Flowers says that these are a symbol of devotion, so I thought they perfectly suit her loving nature and the way she’s so devoted to her family. I love the way, too, that the swirls of the peony’s petals echo the amazing curves and swirls in her fur. I paired the peonies with little Gypsophila flowers, also called ‘Baby’s Breath’, which means innocence and a childlike nature – perfect for our quirky little pug. I chose the rich, royal blue background to signify her calm, dignified nature, and also her history as a royal favourite. I really like Lizzy’s special pug art. I adore the sweet, loving expression in her wide eyes, and her funny, crinkled face, surrounded by the extravagance of the gorgeous, peony blooms. She’s full of adoration for her family and is happy just to be with you! Rich, classic colours and sublime swirls – a quirky artwork brim full of sweetness and beauty..